Abington Friends Meeting House. Photo credit: Montgomery County Planning Commission. William Williams, Portrait of Benjamin Lay, 1750-1758, courtesy National Portrait Gallery, Washington, DC. 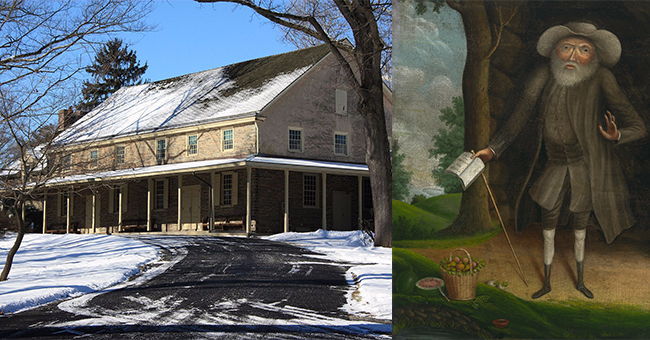 This month, the Abington Quakers of Pennsylvania have recognized him as “a Friend of the Truth” and reclaimed him as a Quaker in an official statement. Shortly afterward, the North London Quakers followed suit and declared their own “unity” with his spirit. These are astounding decisions that restore Lay’s pivotal role in activist, abolitionist, and Quaker history. In this interview with Marcus Rediker, historian and author of Lay’s biography, The Fearless Benjamin Lay: The Quaker Dwarf Who Became the First Revolutionary Abolitionist, discusses Lay and his place in history. Marcus Rediker: I was, quite frankly, moved to tears. The recognition represented a profound, heartfelt act of retrospective justice, because Lay had been unjustly disowned in the first place. It was a symbolic rejection of what a previous slave-owning generation of Quakers had done and it was simultaneously an affirmation that Benjamin Lay’s values matter to the Abington and North London communities. I learned during my research that Lay dearly loved his fellow Quakers—at least those who did not own slaves—and that his exclusion was terribly painful to him. It was therefore deeply touching, 279 years later, to know that he has been brought back into the fold. This act would have meant everything to him. CC: Can you tell us a little bit about why Benjamin Lay was disowned by the Quaker community back in 1738? MR: Lay was disowned primarily for his protests against slavery, which were aimed at wealthy Quaker slave-owners. He believed that slave-owning was “the greatest sin in the world” and that it was destroying both his beloved faith and the larger society. He refused to cooperate with slave-owners in any way, disrupting meeting after meeting to protest their presence and participation in the religious life of the Society of Friends. He performed spectacular acts of guerrilla theater in public to shame slave-owners and to dramatize how Quakers and the world must change. As a matter of deeply help principle, Lay always spoke truth to power; he was punished for it. CC: Was the recognition an easy decision for them to make? MR: Quakers use a consensus model for making decisions, so every reservation must be heard and discussed before a conclusion is reached. Whether and how to recognize a controversial, long-deceased former member of the community are complex questions. In the end the decision was unanimous and enthusiastic. CC: Did The Fearless Benjamin Lay play a role in the decision? MR: I spoke about Lay at the Abington Meeting House on two occasions, in February 2015 and again in October 2017, to large and seriously engaged audiences. I think my research may have helped people to understand Lay’s historical importance and the nature of the conflicts that led to his disownment. But I would emphasize that this recognition was entirely the result of internal processes among the Abington and North London Quakers. CC: How else is Lay being commemorated by the Abington Quakers? MR: As it happened, the bodies of Benjamin and his wife Sarah are buried, like all other Quakers of their era, in an unmarked grave in the Abington Quaker Burial Ground, which is adjacent to the Meeting House. (Sarah was buried as a member of the congregation, Benjamin as a non-member.) The meeting has now decided to create an engraved stone grave-marker for Benjamin and Sarah, which is another important acknowledgment of their place in local history. CC: What is the significance of this extraordinary decision? MR: The significance is two-fold. First, this is a major step by Quakers to reckon with their own slave-owning past. As such, it is exemplary for the US and the UK as nations. Second, the decision advances the process of restoring Benjamin Lay to his rightful, important place in the history of Quakerism. This, in turn, feeds a larger effort to restore him to his proper position in American, British, and world history. Marcus Rediker's The Fearless Benjamin Lay is out now and available to purchase on the Verso website.